True Fitness supports the Shape Run as Official Fitness Partner for the last 6 years. In preparation for the big race day, True Fitness creates race clinics where our instructors will impart tips to help participants peak their race performance and sustain a well-balanced training regime. These race clinic participants will also get to enhance their fitness at a hot yoga class to hone a strong svelte silhouette and increase their emotional wellbeing. Organized by SPH Magazines Pte Ltd (SPH Magazines), Shape Run 2013 will take place on Sunday, 27 October at Nicoll Highway. In its 8th edition this year, the popular women-only race event returns with a new non-competitive 2.4km stroller fun run. New mothers can mark this date in their calendars and embark on the path of getting back in shape - together with their little tots! Female runners aged 16 years and above can also take part in the customary categories of 5km and 10km races. True Fitness is the Official Fitness Sponsor for Manhunt Singapore 2013 where Manhunt finalists will train in True Fitness centres to peak their fitness and physiques in preparation for the competition. Apart from the free weights and functional training zones, they also take on 1st in Singapore circuit training programme Synrgy360TM for explosive workouts. Venturing beyond their comfort zone, the Manhunt finalists are also game to sweat it out in a Hot Yoga class for body and mind conditioning. The variety of dynamic training and exercise programs available at True Fitness will let them emerge lean, chiselled and strong - at the top of their fitness game. True Fitness was the strategic partner of Clarin’s launch of Body Lift Cellulite Control – made from an improved formula of its previous best-selling product High Definition Body Lift. To demonstrate the results of exercise combined with the body toning products, True Fitness conducted a Shape Up! workshop over the weekend for Clarins and True Fitness members at NTUC Income Tampines Junction. The iconic mass aerobic workout organized by NTUC U Sports held another successful event this year with True Fitness as its Official Training Partner. Providing a weekend of fitness and fun, participants were able to work out to 10 different mass workout sessions led by True Fitness instructors over two days. 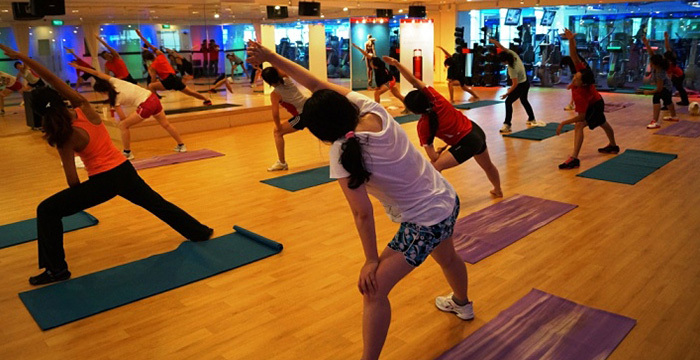 For participants new to fitness, the variety of classes that included dance, yoga and aerobic kickboxing were useful to find their ideal workout that suited their interest and lifestyles. Sunrise in the City (SITC) is a morning workout programme initiated by the Health Promotion Board, in collaboration with True Fitness and True Yoga as one of its strategic gym and yoga partners.